A tiny island called Capri is located across the Gulf of Naples, Italy, looks so charming. Clear seawater, bluish green, and a white sand beach is decorated row of rocks. There are also underwater caves and ruins of houses relics of the Roman Empire. 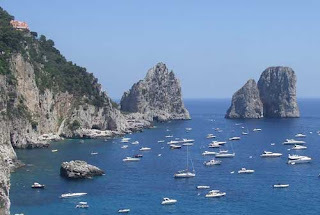 As one of the world's best island, Capri frequently visited Hollywood stars, even the world's richest people. It is said that Queen Elizabeth could have a private home on the island, although this time the house was razed to the ground. Luxury that presented on this island, making the prices on Capri tend to be expensive, such as for food or other services. But it did not dampen the intention tourists to visit. Even in summer the number of visitors is more then the locals. Given the size of the island is not too big, just one day to explore it. The beauty of the island that should not be overlooked is the Grotta Azzura (blue cave), a cave behind the cliff edge with panoramic sea views. Do not forget to get around the barrier reef island to witness the boundary between the sea and the island is no less unique. One of the beautiful buildings on the island is owned villa named Alex Munthe Swedish resident who built his own villa with a mix of ancient heritage objects emperor Tiberius. 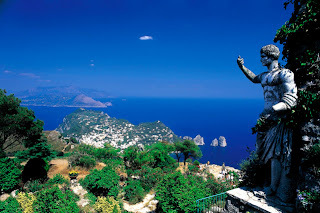 Garden of the villa is decorated Roman marble statues, complete with beautiful sea views.